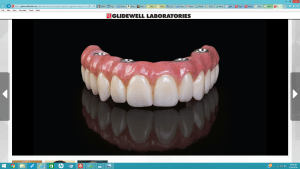 Yes– we make beautiful full zirconia full arch restorations supported by dental implants. Full arch replacements are fastened into the mouth mounted on dental implants, so they are usable to the patients–[more like real teeth]. Zirconia is not plastic, so it does not soak in water or stains [which is called water sorption in dental terminology]. These restorations do not move, stain or chip [actually nearly indestructable]. People really like them.